Ever wondered about the difference between file types and images? Most digital camera owners, graphic designers and graphic designers use two types of computer image files, raster images and vector images. Even though they may seem similar, they do differ in many ways. Raster pictures or files are also called bitmap images. These are naturally scanned images, photographs and images created using software like Photoshop. These raster files or images are created using colored pixels. Pixels are yet again, small colored squares that together form a digital image, very similar to that of tiles forming together to create a mosaic. Hence, raster images and files are created out of thousands of tiny dots known as pixels. When you create or edit an image with pixels, this allows for rich detail in the image. Since each dot can be of differing colors, it also allows for any type of color change. Raster files are the best for rendering rich full color images like in photography. But then, raster file images have their drawbacks too. All the zeros and ones that are used to create each pixel ultimately results in large file sizes. This causes editing to be much slower. Moreover, raster files don’t resize well. When you attempt to resize a raster image, the pixels just seem to get larger and the images appear distorted and chunky. Photo editors as Adobe Photoshop use raster based images to enable precise editing and total freedom in image appearance. Vector files create images in a totally different manner. It does not create images on a pixel-by-pixel basis. Whereas in a raster-based software a square would be created out of thousands of pixels, with the vector software a square would be created out of only four dots, one on each corner. These vector points allow your computer to play the game of “connect the dots”! Each vector point has mathematical information which effectively instructs the computer on how to connect each point with straight or curved lines and also what color to fill in the closed shapes. When the image is finally printed, the vector points would become invisible. Since the computer needs to keep just four points in its memory, editing is easier too. When a vector-based image is resized, none of the detail is lost. 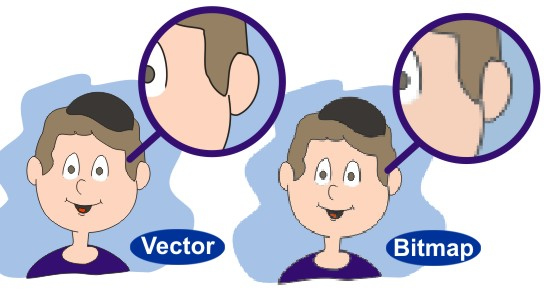 The vector points spread out and the computer needs to just redraw the whole image. Using drawing software like Adobe Illustrator, you can color or recolor a vector based image. Vector files do have some tiny limitations too. Mostly, the vector images are filled with a solid color or gradients but they do not display the deep color depths of a raster image. Drawing software such as the Adobe Illustrator and Macromedia Freehand use the vector based drawing mode, which facilitates scalability and cleanliness. Business cards, brochures and stationary are most often designed with both vector and raster file formats used together.